Designing birdhouses is just plain fun! In fact, the sillier and goofier the better! If I was a bird, I would want to live in a crazy colorful house. 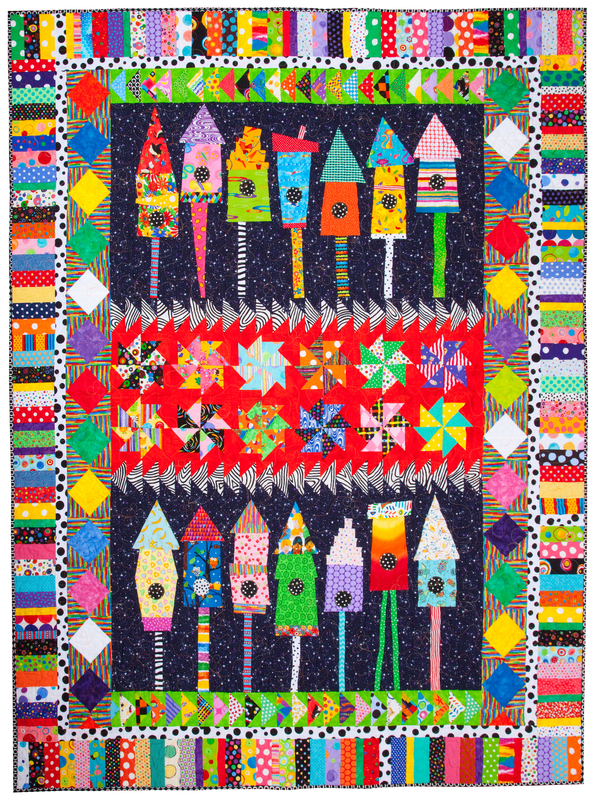 The other parts to the quilt are flying geese (“headless” I call them since I usually chop off the point at the top), pinwheels (I love those!) and simple blocks on point. Hi Christine, thank you! I love houses too – so many fun ways to make them all! I think this just might be my all-time favorite quilt that you’ve made. It is sooo darn crazy cute! tee-hee 🙂 Thanks Diana!! Hope you are doing well! I love it! It’s so fun and bright! Hi Christa! Thank you 🙂 Making birdhouses makes me giggle – glad you liked them too. Have a great day. Super cute. Love the design and the colors. Hi Alyssa! Thank you 🙂 The birdhouses are so fun to make and super easy. Thanks for stopping by. These are great fun. Perfect for your fantastic fabric choices. If I was a bird I would happily live here, too. I love all the Easter goodies your swap-partner sent to you! What a fun thing to do. Did you send her one of your awesome knit animals? Sorry, Linda. I am a bit late catching up. No, I have not sent her anything! In this swap we have random partners and the one you send to is not the same one you receive from. My parcel goes off next week. This is too cute! I especially like the whole center – the zebra geese and pinwheels. Really fun! This is so much fun! I love the colors and all the different fabrics! It gives you so many different things to look at. Excellent piecing! Hi Tina 🙂 Thank you very much for your sweet comment – you made me smile! DItto!!! LOVE it with all it’s colors and who can resist birdhouses!!! I love checking out your website! You’ve always got an interesting project in the works! PS I added ya to my blogroll. Stop by and check out my Tuesday Archives Linky at myplvl.blogspot.com. ANd if ya like what ya see….I hope you’ll join in and follow too! Wow, this is spectacularly colorful, and what a great treatment of birdhouses! I think I want some of these in my backyard!!! Tee-hee! I would love to have those hanging from trees too. Wouldn’t that be fun?! Crazy they may be but they brightened my day! !